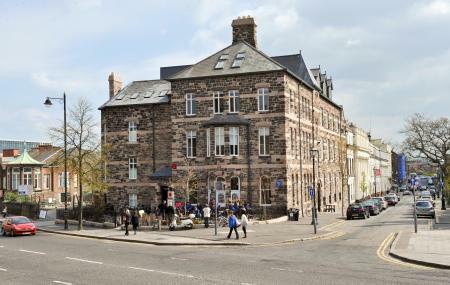 The Crescent Arts Centre hosts live music performances, theatre and several other events making for an entertainment zone in the city of Belfast. The center presents two festivals each year and is home to a dance workshop that’s accessible to all. Exhibitions are also held occasionally in the dedicated gallery spaces occasionally. The 1st Friday of every month is a poetry night where new readers are also given a chance to establish their talent. Ticket prices will differ with shows. Visiting hours will depend on show timings. How popular is Crescent Arts Centre? People normally club together Rise and Dunmurry Golf Club while planning their visit to Crescent Arts Centre. Lots of courses and events. Worth a look. Only been here once to meet with the team taking my sis on dream flight to America, there was a big enough hall with tables all set out for this occasion. But there is a cafe on your right when u go into the building. I didn't try the cafè, but the art centre is nice and has a large choice of art courses. Also here are held many events.